In the quick view, it appears that the main difference between 2007 and 2012 is that there are not a lot of differences. After correcting for inflation (the 2007 numbers have been adjusted to reflect 2012 dollars), total net income has held … steady (within the margins of error, certainly). Slight increases overall appear to be the state of affairs. 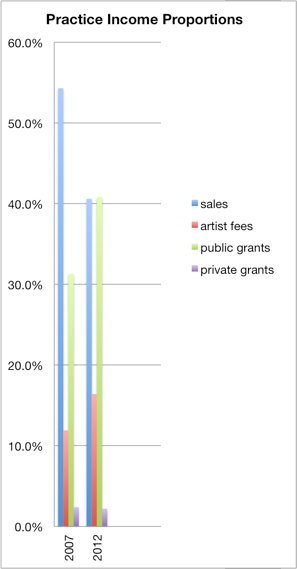 For instance, total average income for an artist in 2007 was $27,581, and median was 21,788. In 2012, on the other hand, total average climbed to $29,257 (an increase of around 6%) and the median comes in at $21,603 (a decrease of around 1%). This suggests that the recession did not have a significant effect on artists’ incomes. Income inequality, as evidenced by a comparison of median to mean, has increased somewhat, but the overall picture remains effectively the same. To better visualize the numbers presented in the table above, we graphed them using boxplot charts, which offer the ability to see not only see the mean and medians, but also see the dispersion of the range of the numbers. Each boxplot presents the data as broken into four quartiles, so that the line at the bottom represents the bottom 25%, the two boxes which make up the main body of the plot are the middle quartiles (25-50% of respondants; 50-75%), and the line on the top representing the top 25%. The median is the line which divides the box in two, and the small red line represents the average. The one area that shows the potential effect of the recession most strongly is gallery representation, which dropped from just over 40% in 2007 to 31% in 2012. 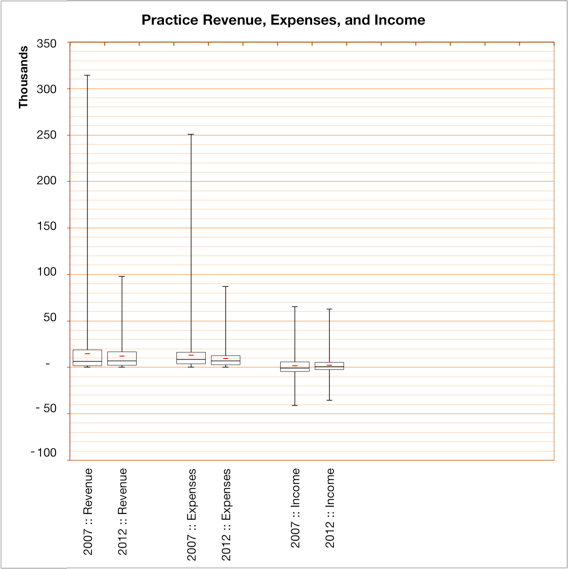 Whether from galleries closing, or rationalizing their stables, the effect is most clear when we look at the proportion of practice-based income. In 2007, around 55% of practice income was earned from sales. This drops to just over 40% in 2012. From our analysis of 2007 (see the full 2007 report), we saw that increases in sales saw a correlated increase in both expenses and time spent in the studio. This current back-of-envelope sketch shows this correlation holds, with time in the studio and practice expenses dropping overall. 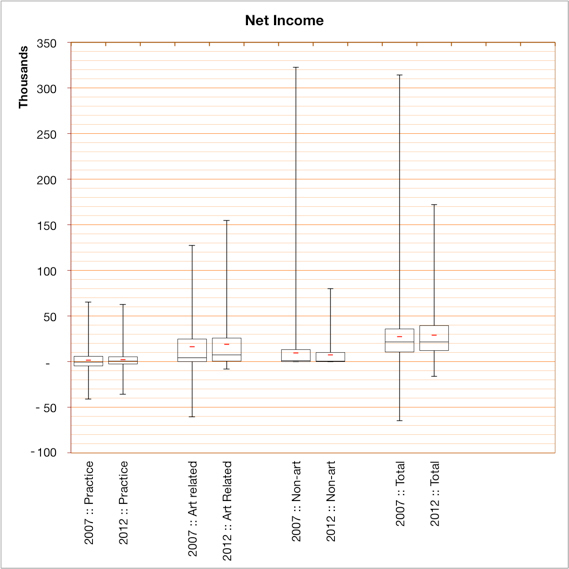 Thus, while net practice income has indeed increased, this increase is attributable not to increased gross income but rather to lower expenses. note: this is the first of a series of posts on the results. New postings will be coming as we complete various analyses on the data.